When Windows Vista was first launched, there were some excitement among hacking community to deliver crack for unlimited rearm, but soon it’s obvious that it’s a failed experiment to run Windows Vista forever without activation, with the help of rearm command and skiprearm, which despite its name, does not mean to allow rearm process to be done more than the official three times allowed (four, if including the initial 30 days given). When Windows 7 is launched, the same not working unlimited rearm theory been floated and presented on some blogs again, which is incorrect and deceiving information. But now, there may be a true crack method which allows Windows 7 to be installed and run forever, without activation, without modding the BIOS, and without applying any activation cracks. In Windows 7, Microsoft re-introduced a WPA registry key which contains Last Rearm Time info in Windows 7. The WPA registry key opens a vulnerability to exploit in order to reset rearm count available in Windows 7 to revert back to original four (4) allowed. Windows 7 allows user to rearm 3 times (4 actually where one is used on installed automatically), where rearm resets the activation-free allowance period back to 30 days. With 3 rearms, plus the 30 days free usage period right after installation, users can potentially use and run Windows 7 for free for up to 120 days, as trial or evaluation period. After each rearm is performed, the rearm count available is reduced by 1, and when the rearm count left reaches 0, users cannot rearm the system to reset the activation grace period anymore. If the activation is not done by now, system will be labeled as non-genuine status with various annoyances including black desktop and frequent warning messages to activate. Hackers have managed to find a method to reset rearm count in Windows 7 so that the free remaining rearm count will be back to 4, allowing the whole cycle of rearming and resetting Windows 7 activation grace period to be done again, for infinity times. The hack, when done properly, can make Windows 7 be used forever, without activation, and without any activation crack. In this case, the license status for Windows 7 stays indefinitely in initial grace period, which is genuine status when validated by WGA (Windows Genuine Advantage) validation tool. The main problem is that the registry key cannot be accessed from within Windows operating system, and thus the operation has to be done from within WinRE (Windows Recovery Environment) or WinPE (Windows Pre-installation Environment). To access WinRE or WinPE, a reboot of computer is required. After hard works by various peple such as timesurfer, MasterDisaster, 7ekn00, PAYMYRENT, mcclausky, tuvi123, MadSheep!, BOX and sam3971 at My Digital Life forums, a few automated tools (with minimal manual steps) have been developed in the name of InfiniteRearm4, Windows7 Rearm4 and Windows 7 Rearm Forever, collectively can be known as rearm count reset utilities. 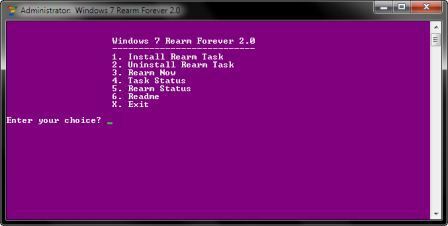 The rearm count reset tools automates the process to reset the used rearm count in Windows 7, install default Windows 7 product key which allows for 30 days activation grace period, and install a Windows’ scheduled task which automatically rearm Windows 7 on last day (29th or 30th day) of activation grace period. 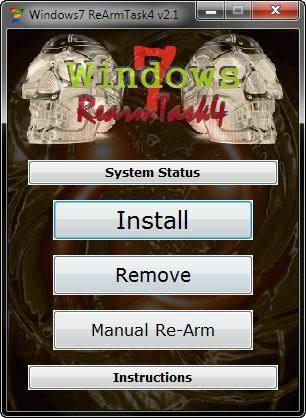 The helper programs also allow users to easily check how many rearms are left (available), manually rearm, check that the task to rearm automatically is running, and uninstall the 29 day rearm task created with the uninstall button. 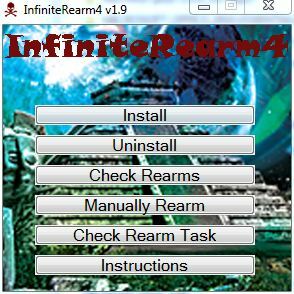 The InfiniteRearm4, Windows7 Rearm4 and Windows 7 Rearm Forever has automated the installation of the “unlimited rearm crack” (not a crack really, just install the script to perform rearm count reset and scheduled task to rearm), users still need to do some manual steps to trigger the rearm count reset. Enter your language and logon info. Note: In the WinRE and the WinPE, the drive letter of the OS changes from C: to D: if and only if you have the System Reserved partition, otherwise it is C: drive. After logon, ignore the watermark and any non-genuine warnings and then wait for a while till a message box is displayed. Type Task Scheduler in the Start Search, and hit Enter to open it. Select Task Scheduler Library in the left pane. In the Rearm Properties window, select Settings tab. Check the Run task as soon as possible if the scheduled start is missed option. Click on OK and close Task Scheduler. Click on Check Rearm Task button to see if task is ready. Click on Check Rearms button to see how many rearms remaining. Click on Manually Rearm button to rearm. Click on Uninstall button to uninstall the program. Tip 1: Above steps do not require a Windows 7 DVD, and thus user is required to enter login credentials. Using the Windows installation disc or Windows 7 System Repair Disc to boot into WinPE does not require user to enter login credentials. Tip 2: Any edition of Windows 7 installation DVD can be used to perform the rearm count reset process. Tip 3: User can rearm only before extended grace period expires, but not after. If you have missed your scheduled rearm time, and the PC has gone into non-genuine notification mode with grace period expires, you will not be able to rearm. In this scenario, the two ways out is install a legit product key (if you plan to do that you won’t look at this article), or reboot into WinPE or WinRE and run reset.bat. Interesting to note that the unlimited rearm hack does not work in Windows Vista, as the vulnerability does not exist in Windows Vista. The WPA registry key was part of Windows XP activation process, but was removed in Windows Vista when activation scheme changed to Software Licensing. WPA registry key was re-added when switched to Software Protection Platform in Windows 7. Thus, the loophole can be easily closed by Microsoft with a hotfix or update via Windows Update. So use Windows 7 for free while it lasts.